Modern black crystal award in swoop design with silver plated star feature. 25cm / 10in tall. Supplied boxed. These superb crystal awards are handcrafted in black onyx and feature a very stylish and contemporary 'swoop' design. 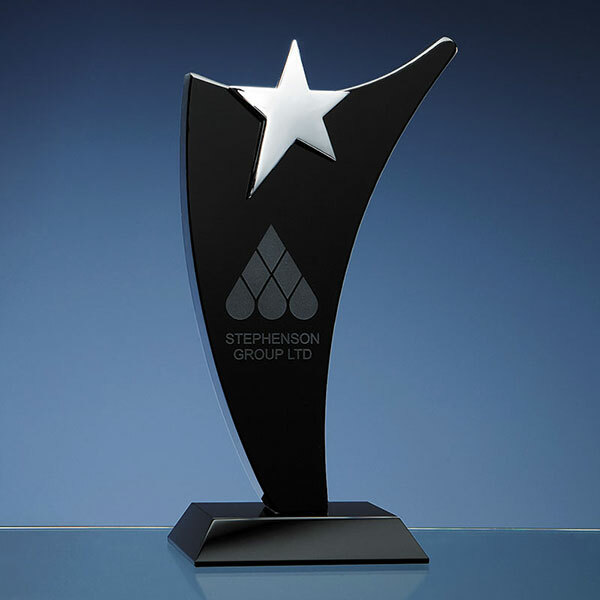 Mounted on a bevelled black crystal base, they incorporate a silver plated star at the top of the award. The flat front of the award is perfect for engraving, and these awards are offered with low-cost engraving of text and logos. These highly distinctive awards are suitable for a wide variety of achievements, from corporate recognition awards to sports trophies to industry awards and more. Each award is supplied in a foam-lined black presentation box.